The HBA is easy to use. The participant sits in the papasan chair, places their hands on the curved silver surfaces, and relaxes. Within a few seconds, the HBA optimizes its amplification for the participant. 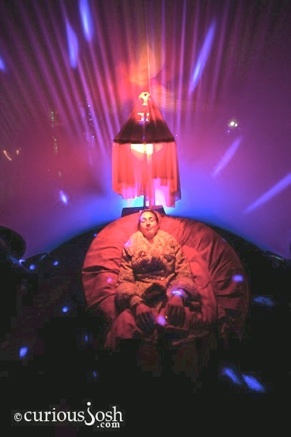 The participant begins to hear the sound of their heartbeat and the simple red light, above their head, begins to flash with the advent of each beat. The HBA is comprised of a papasan chair with incorporated ECG sensors, amplifiers and feedback transducers. As soon as the participant sits in the HBA, the HBA adjusts its amplification and visceral feedback to match the participant’s ECG. The ECG signal level is about 1mV (1/1000th of a volt). The HBA amplifies this signal, about 30,000 times, to drive low frequency subwoofers in the chair. The HBA provides clear feedback as to the relationship between heart and breath. As one inspires, the expanding lungs compress the heart and also subtly reduces the level of the heart’s electrical signal (ECG). Upon expiration, the heart expands, as the lungs deflate, and the heart’s signal increases. Variations in heart rate (BPM) also happen during the changes from inspiration to expiration. The Heartbeat Amplifier (HBA) is a viscerally interactive art project that passively monitors the participant’s heartbeat, via electrocardiogram (ECG) signal. The human-sensitive papasan chair amplifies and condition the participant’s ECG to drive audio, haptic (touch sensation), visual and thermal transducers to stimulate those respective perceptual pathways in the participant.